Good afternoon fellow Seekers,California’s at it again. When are they going to learn? It is becoming a more popular opinion to let California secede from the US. Then build the damned wall around them as well. As the saying goes, “Be careful what you wish for”. Or in this case…BOW TO. The two groups are the Islamic Networks Group (ING) and the Council on American-Islamic Relations (CAIR), the latter of which is aggressive in spreading dawah and the “Islamophobia” canard. Both the California and U.S. Constitutions prohibit the government from aiding religious sects or favoring one religious organization over another. 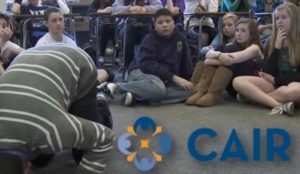 Such indoctrination is not restricted to California public school students. It is increasingly widespread, including in Canada. Take, for example, B’nai Brith Canada, which drew attention to an official guidebook published by the Toronto District School Board that condemned “Islamophobia” and defined the term to include “dislike directed…towards Islamic politics or culture.” This guidebook was prepared with the support of the National Council of Canadian Muslims (CAIR-CAN). The Toronto public school board guide also pushed Muslim greetings duringmorning announcements.